It was a horrible, terrible, exceptionally bad day for SEC teams with NCAA Tournament hopes. Kentucky lost. Tennessee lost. Alabama lost. But Ole Miss may have sank. 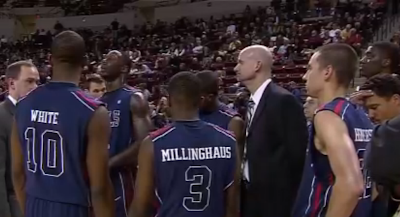 The Rebels were a 12-point favorite at Mississippi State, who had lost 13 in a row. The Bulldogs' season had been marred by suspensions and injuries, and looked to be just playing out the string - except when it came to spoiling the hopes of their hated in-state rivals. The ragtag Bulldogs held on behind a gutty effort and a boisterous crowd, and may have finished an Ole Miss season that once looked so promising. As of this evening, esteemed ESPN Bracketologist Joe Lunardi had only 2 SEC teams in. Florida still has a shot at a very high seed despite the performance of their conference as a whole. And Missouri (where I was today) solidified their position with a thorough win over surging LSU. Lunardi has Kentucky, Alabama, Tennessee, and Ole Miss on the outside looking in. There's still time to play their ways in, but time is running out. If they hadn't noticed the calendar has already flipped to March. And the Ole Miss campus may not be experiencing the madness...again. They'll just be plain mad.